Tag line: "WHAT IS IT... How much terror can you stand?" 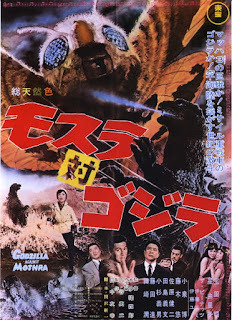 The 4th movie in the Godzilla franchise (after Godzilla, Godzilla Raids Again, and King Kong vs. Godzilla) and the second to feature Mothra (released three years after the original), Mothra vs. Godzilla started a trend, matching two of Toho’s Kaijus against one another in the same picture. And as you’d expect, when these giant monsters meet on the battlefield, the result is one hell of an epic fight. While in a small coastal village reporting on the damage caused by a recent typhoon, newsman Ichiro Sakai (Akira Takarada) and his photographer Junko Nakanishi (Yuriko Hoshi), witness what proves to be an amazing find: a giant, brightly-colored egg floating in the middle of the ocean. The egg is promptly retrieved by some local fishermen, but when scientist Shunsuke Miura (Hiroshi Koizumi) attempts to examine it, he’s informed that the egg was just purchased by a businessman named Kumayama (Yoshifumi Tajima), who, teaming up with millionaire tycoon Torahata (Kenji Sahara), announces his intentions to turn the egg into a tourist attraction. Soon after these plans are announced, the tiny twins from Mothra Island (played by Emi and Yumi Ito) show up, and, after explaining that the egg, which belongs to Mothra, was swept away in the typhoon, ask that it be immediately returned. When Kumayama and Torahata refuse to part with it, the twins have no alternative but to go home empty-handed. But the egg wasn’t the only thing caught in the storm; while taking pictures of the landscape, Junko notices the ground is moving, and within moments, Godzilla, who had been buried under the sand, stands up, and begins wreaking havoc across the countryside. When military weapons fail to take Godzilla down, Sakai, Junco, and the scientist Miura head to Mothra Island, where they ask Mothra (through the twins) to help them drive Godzilla away. Will Mothra agree to assist those who refused to turn over her egg, or will Japan instead be decimated by the mighty Godzilla? Though it features a handful of cool scenes (the one where Godzilla rises out of the ground is positively awesome), it’s the battle between the two giant monsters that makes Mothra vs. Godzilla so much fun. At first glance, you’d think Mothra would be at a severe disadvantage (along with Godzilla’s incredible strength, he has fire breath that’s powerful enough to melt stone), but as it turns out, the humongous flying insect has a few moves that catch her opponent (and the audience) off-guard (when Godzilla threatens the egg, Mothra grabs him by the tail and drags him hundreds of feet in the opposite direction). Yet as good a job as Mothra does, it’s two creatures appearing late in the film that give Godzilla a real run for his money. As with some of the earlier entries in the series, Mothra vs. Godzilla has plenty to say about nuclear testing; when Sakai, Junco, and Miura first arrive on Mothra’s Island, they’re shocked to find what was once a lush, green paradise has (thanks to a string of tests conducted in the area) been reduced to a grey wasteland. But along with its anti-nukes stance, the film also takes some effective jabs at commercialism (aside from purchasing the egg, Kumayama and Torahata are so amazed by the miniscule twins from Mothra Island that they attempt to buy them as well). Though not subtle, these messages definitely hit their mark, and, combined with the exciting action scenes and well-realized special effects (for the early ‘60s, anyway), make Mothra vs. Godzilla one of Toho’s most entertaining outings.